BOSTON (BRAIN) — Cat Bartash, the buyer at Ace Wheelworks in Boston, will be among the speakers at the fifth annual Aligned Conference in October. 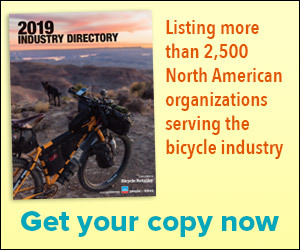 SUN VALLEY, Idaho (BRAIN) — CrankTank, which is holding its first Impact media summit in its hometown of Sun Valley next month, is also planning to organize a media event before the Fall Outerbike consumer expo, held in Moab, Utah. INDIANAPOLIS (BRAIN) — The second annual PlacesForBikes Conference takes place this week here. Organized by PeopleForBikes, the conference kicks off Tuesday afternoon and runs through Thursday. SAN JUAN CAPISTRANO, Calif. (BRAIN) — Organizers of the Outdoor Retailer Snow Show have moved next year's show in Denver a few weeks later than previously planned. KETCHUM, Idaho (BRAIN) — CrankTank has announced Specialized and Maxxis will attend its Impact Media Summit, planned for June 26-27 in Sun Valley. KETCHUM, Idaho (BRAIN) — CrankTank has announced two new brand sponsors for its June Impact Media Summit in Sun Valley. The event organizer also announced that Sun Valley-based endurance rider Rebecca Rusch and bike media veteran Zap Espinoza will participate in a PeopleForBikes Draft Meetup event planned for the closing evening of the Summit. BOULDER, Colo. (BRAIN) — PeopleForBikes has announced some of the keynote speakers to headline its second annual PlacesForBikes Conference coming up May 1-3 in Indianapolis.